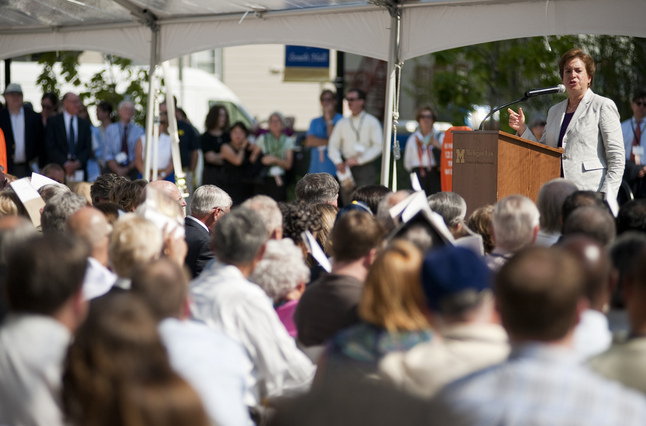 Posted on Fri, Sep 7, 2012 : 5 p.m.
Supreme Court Justice Elena Kagan addresses a crowd during the dedication of the University of Michigan Law School's new South Hall. Supreme Court Associate Justice Elena Kagan appeared in Ann Arbor Friday morning to discuss a range of weighty topics — from cameras in the courtroom to the politicization of the nation’s highest court. But there also were lighter moments, from Kagan’s role bringing frozen yogurt to the court to the court’s aversion to technology. Kagan’s appearance was part of Friday’s dedication of South Hall, the University of Michigan Law School’s newest academic building. Like a pair of bookends, Chief Justice of the Supreme Court John Roberts Jr. attended the ground breaking for the new building three years ago. Kagan and U-M Law School Dean Evan Caminker sat in upholstered chairs on the stage of a packed Power Center in front of an audience heavy with lawyers, judges and law school students. Kagan was to appear later in the day for the actual building dedication. Kagan is the court’s newest justice, appointed two years ago by President Barack Obama. Before that, she had served as the nation’s solicitor general. Two years ago, Kagan said she would have backed having cameras in the courtroom as a way to encourage transparency. But time has shifted her thinking. “I have a few worries, including that people might play to the camera. Sometimes you see that when you watch Congressional hearings,” Kagan said. There’s also concern over how footage would be used. The court releases audio recordings of high profile cases. One clip was quickly used in a political TV advertisement. Kagan said she’s seen the low public opinion poll numbers for the Supreme Court, but didn’t know if they reflect a decline in confidence with all government, or if it specifically reflected thoughts about the high court. “But I don’t want to discount the theory that there are feelings that the court has become politically divided,” Kagan said. Nevertheless, it’s untrue, she said. “Not a single member of the court, even for a single time, has based a decision on ‘Do I like this president or do I not like this president,’ Kagan said. “It’s not the way members of the court think.” Rather, it boils down to different judicial methods and constitutional decision-making, she said.
. Still, I think it would be a good thing if we had fewer 5-4 splits,” she said. The shift to a Supreme Court Bar, with experienced lawyers who regularly appear before the high court for oral arguments, and away from lawyers who originally handled a case finding their way before the high court, is a good one, Kagan said. “They understand what the exercise is about and are extremely good at it. It means were are actually getting answers to our questions.” There still needs to be improvement on the criminal defense side, Kagan said. “Often, these people are appearing before the Supreme Court for the first time. I hope that changes in the future.” She pointed to a Social Security case before Chief Justice William Rehnquist’s court she witnessed when she was a clerk. “The (lawyer) came up to the podium and told (Rehnquist) that he’d like to introduce his family. He turned around and introduced his wife and three children. Chief Justice Rehnquist was flabbergasted,” Kagan said. Sat, Sep 8, 2012 : 4:29 a.m. Reader - The conservative majority's (and apparently yours) high-minded respect for statutes as written? You must mean its cavalierly throwing out statute after statute, be they involve affirmative action, environmental/wetlands protection, gun control, campaign finance (Citizens United), and (though one vote short) the health-care law. Oh, and you forgot to mention a respect for precedent - you know, that little thing called stare decisis. There, too, your conservative majority falls way short, whether it's creating rights from whole cloth or brazenly ignored time-honored precedent in order to achieve a desired result. Bush/Gore, Citizens United, two recent gun-control decisions, and its past 15 or so years of affirmative-action and Fourth Amendment jurisprudence immediately leap to mind as examples. And were it not 12:30 in the morning, I'd be able to come up with many more .... Bottom line, the Court's conservative majority, not its Clinton/Obama-appoined brethren, are the activists who do not respect laws or prior court decisions as written. Sat, Sep 8, 2012 : 12:39 p.m. The conservatives engage in activist rulings also--it's not reserved for liberals, it must be human nature. In Citizens United, I'd say that corporations aren't people and so aren't entitled to free speech, because I don't think that was the intent of the drafters of the first amendment, Bush v. Gore should have been thrown out at the district court level, Bush didn't have standing to bring a claim of discrimination on the basis of how Florida counts votes. Just GENERALY, I think the way conservatives come to their decisions is correct. The health care laws provision of a PENALTY is not a tax. A penalty raises revenue INCIDENTALY, it's not the primary purpose. Its primary purpose is to induce behavior. Mark, most law schools ARE facing declining enrollment, while others are admitting fewer students. See, e.g., http://www.cleveland.com/metro/index.ssf/2012/07/law_schools_see_drop_in_applic.html Michigan, in contrast, is (apparently) expanding b/c, one assumes, it's one of the most-prestigious law schools in the country and, thus, is largely immune from the nation's economic woes and the poor job prospects faced by graduates of second- and third-tier law schools. Sat, Sep 8, 2012 : 1 a.m.
Why do the baby lawyers need a new hall. There are too many lawyers as it is and thank god a lot of them are unemployed. They should be contracting law schools and decreasing enrollment . The more lawyers there are the more ways they will think up to create demand for their services. I hope we have the reached saturation point and people will study something useful like science or engineering . Sat, Sep 8, 2012 : 7:57 p.m. Sat, Sep 8, 2012 : 3:53 a.m.
Fri, Sep 7, 2012 : 9:44 p.m. I think when interpreting a law, the court should use the doctrine of &quot;plain language&quot;, and use the concrete meaning of words. They need to give effect to the intent of Congress; I know they think they do that already but the liberals are overly broad when giving a work or phrase meaning. Some also try to return to the original intent of the bill sponsor, even though the sponsor had to compromise with the other party to get some passage, it's the MAJORITY of the legislature that passed the bill as written. Sat, Sep 8, 2012 : 12:10 p.m.
@Doug--To be sure the conservatives engage in activism too. It's definitely not limited to the liberals. I didn't agree with Bush v. Gore. Bush didn't even have standing to bring an equal protection claim lawsuit. But, GENERALY I agree with the way conservatives come to their decision. The health care law was also wrongly decided by John Roberts. Sat, Sep 8, 2012 : 4:28 a.m.
MR - The conservative majority's (and apparently yours) high-minded respect for statutes as written? You must mean its cavalierly throwing out statute after statute, be they involve affirmative action, environmental/wetlands protection, gun control, campaign finance (Citizens United), and (though one vote short) the health-care law. Oh, and you forgot to mention a respect for precedent - you know, that little thing called stare decisis. There, too, your conservative majority falls way short, whether it's creating rights from whole cloth or brazenly ignored time-honored precedent in order to achieve a desired result. Bush/Gore, Citizens United, two recent gun-control decisions, and its past 15 or so years of affirmative-action and Fourth Amendment jurisprudence immediately leap to mind as examples. And were it not 12:30 in the morning, I'd be able to come up with many more .... Bottom line, the Court's conservative majority, not its Clinton/Obama-appoined brethren, are the activists who do not respect laws or prior court decisions as written.